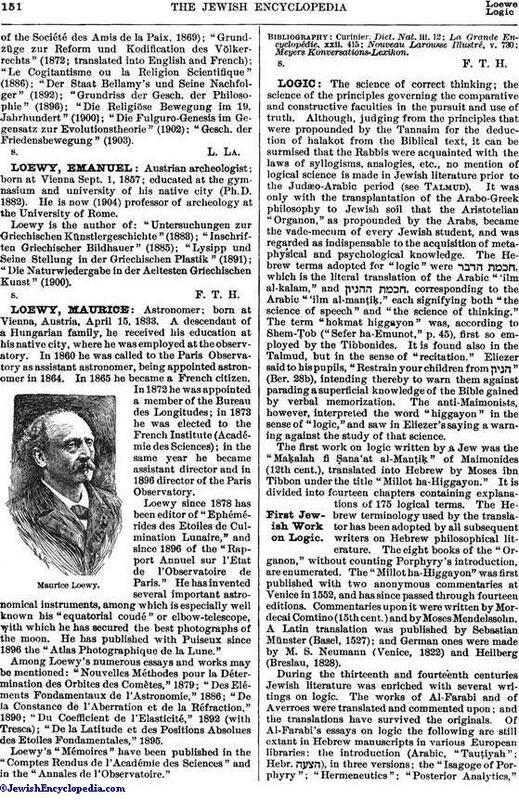 German writer and editor; born March 12, 1836, at Ernsbach, Württemberg; educated at the high school at Stuttgart and at the University of Tübingen, where he studied jurisprudence and philosophy (Ph. D. 1859). He founded at Frankfort-on-the-Main the "Allgemeine Deutsche Universitätszeitung" and became assistant editor on Max Wirth's "Der Arbeitgeber." Soon afterward he became editor of Payne's "Die Glocke" at Leipsic, and established there the "Zeitgeist." 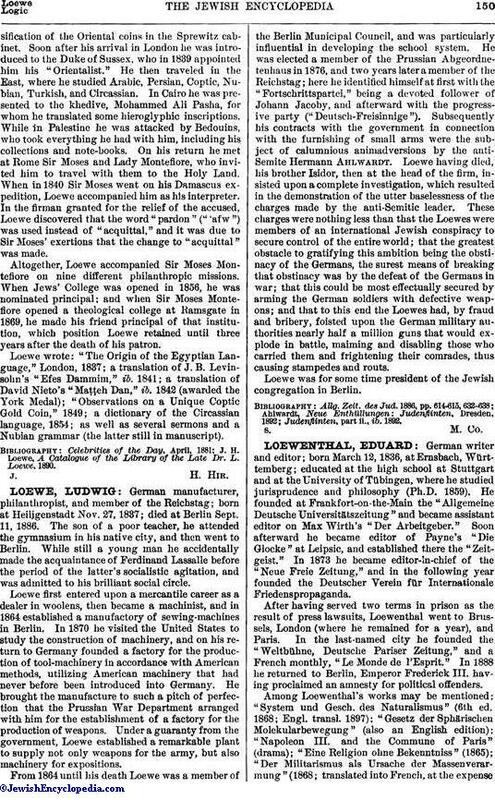 In 1873 he became editor-in-chief of the "Neue Freie Zeitung," and in the following year founded the Deutscher Verein für Internationale Friedenspropaganda. After having served two terms in prison as the result of press lawsuits, Loewenthal went to Brussels, London (where he remained for a year), and Paris. In the last-named city he founded the "Weltbühne, Deutsche Pariser Zeitung," and a French monthly, "Le Monde de l'Esprit." In 1888 he returned to Berlin, Emperor Frederick III. having proclaimed an amnesty for political offenders. Among Loewenthal's works may be mentioned: "System und Gesch. des Naturalismus" (6th ed. 1868; Engl. transl. 1897); "Gesetz der Sphärischen Molekularbewegung" (also an English edition); "Napoleon III. and the Commune of Paris" (drama); "Eine Religion ohne Bekenntniss" (1865); "Der Militarismus als Ursache der Massenverarmung" (1868; translated into French, at the expenseof the Société des Amis de la Paix, 1869); "Grundzüge zur Reform und Kodification des Völkerrechts" (1872; translated into English and French); "Le Cogitantisme ou la Religion Scientifique" (1886); "Der Staat Bellamy's und Seine Nachfolger" (1892); "Grundriss der Gesch. der Philosophie" (1896); "Die Religiöse Bewegung im 19. Jahrhundert" (1900); "Die Fulguro-Genesis im Gegensatz zur Evolutionstheorie" (1902); "Gesch. der Friedensbewegung" (1903).